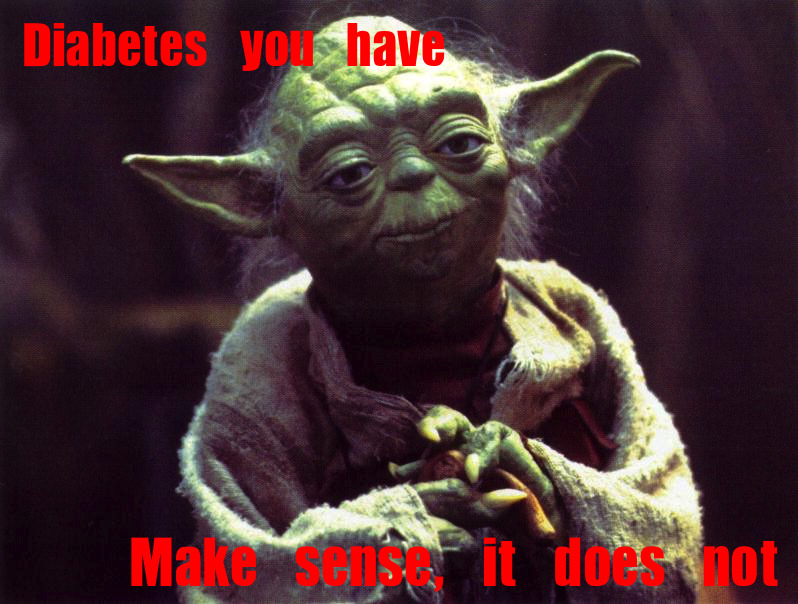 Texting My Pancreas: Make Sense, It Does Not. There's a monstrosity of mostly-carnivorous celebration once a year nearby, named "Ribfest". 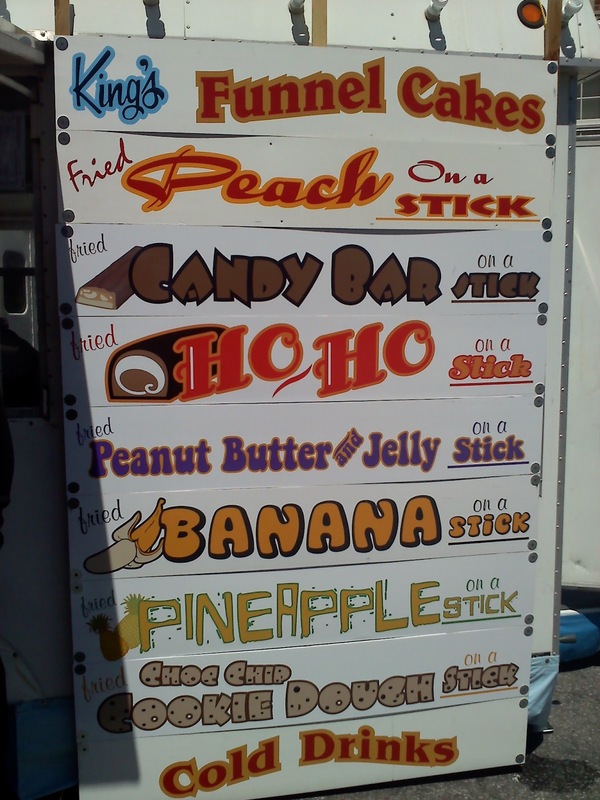 As the name would suggest, there's a lot of food to be tried - ribs, pork, brisket, and just anything you can name On A Stick. Midwestern sterotyping at it's finest. Seeing as how the composition of a funnel cake is much like a donut - mostly fat and sugar - I expected significant CGM graph shenanigans for the next several hours. I tested; I bolused; I ate; I waited for the rocket launch. Except that it never came. Somehow the magical combination of walking, sunshine, mega-bolus, and luck meant that I never left the 105 - 135 range. Success! I guessed 30g of carb for two ears, based on the Ping remote's food listings of "corn on cob wht - 13" and "corn on cob yell - 25". (They were speckled with both.) It wasn't until ten or so minutes after eating that I heard Jim vibrating from the kitchen counter. "HIGH - 180". My CGM was currently reading me at 226, and I stayed above 200 for the next few hours, despite the two correction boluses I threw at it. 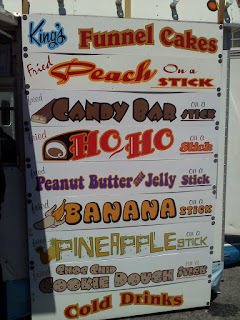 So let's get this straight - a funnel cake keeps me in range, but sweet corn sends me to the moon? I'm not sure even Yoda could explain this one, but I'd sure like to hear him try. Big D always pulling surprises. Corn and all of its byproducts do very mysterious thins to my BGs. It never fails! Oh, the mystery of it all... Great Yoda incorporation there. Oh, and it gives me something to ponder as we approach our own local Ribfest (likely complete with corn, as well). Maybe you should've put an entire stick of butter on that corn! You're lacking the fat that was in the funnel cake. I agree with Sara... I had no idea that yellow and wheat (oh, I guess that's "white") corn had different carb counts. I'm lmao at Yoda. Sometimes same thing happens with J donuts keep him steady and then healthy oatmeal sky rockets him. 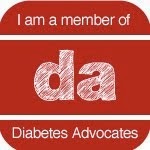 I'm learning just that, diabetes doesn't make any sense. And I think I may just have funnel cake at my next opportunity. Hrmmmm.... I'm wondering if that funnel cake was actually still messing with you? I say this as an expert doughnut eater ( the tres leches from this place is my favorite, http://www.doughnutplant.com/ ). What I try to explain to my sig. o. and family is that diabetes isn't like high school chemistry. It can be really hard to get those perfect numbers. And sometimes it's hard to understand why you're high or low when you expected otherwise. How active I was yesterday and how much I ate yesterday actually affect numbers from today (gospel truth yo). On top of that, stress today and guessing wrong and then dosing wronger will all throw me further off the mark! Love the yoda. I'm voting for the critical carb mass phenomena. I've noticed that if I consume more than some (diabetes determined whimsically and inconsistently defined amount that I call "a lot") number of carbs the I:C ratio that normally works like a charm suddenly isn't sufficient and a normally benign food like popcorn sends me into the stratosphere. At which point I stare at the meter and go "Seriously? Popcorn pissed you off? Seriously?" Seems to me that the fat content is the answer. Fat slows down the absorption of carbs enough to let your insulin work on it. 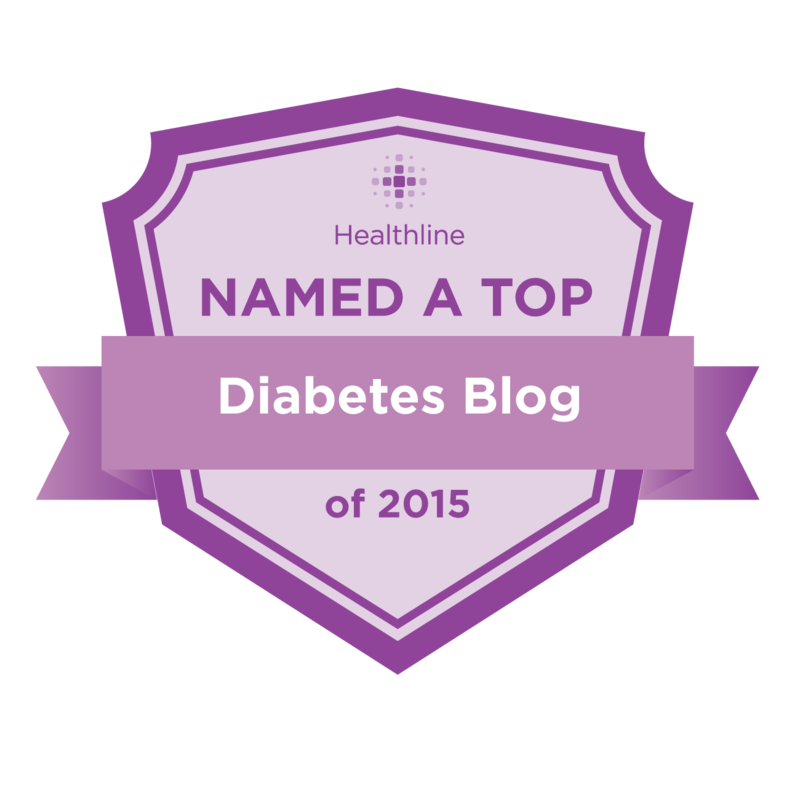 Injected insulin is NOT rapid, despite the name! The corn, on the other hand, was all carb, and little fiber (which really doesn't slow things down in my experience), and it sent you up. And once you're up, the higher BGs cause insulin resistance, and make it hard to get it down. Biochemistry is complicated! I enjoyed your blog, Kim. This is interesting, the funnel cake would have given me a terrible high, but it would have been late because of the fat and protein. The corn does not bother me as much if I eat only one ear, and also have fat with the meal. Corn is best at lunch, because I always exercise soon after that meal. 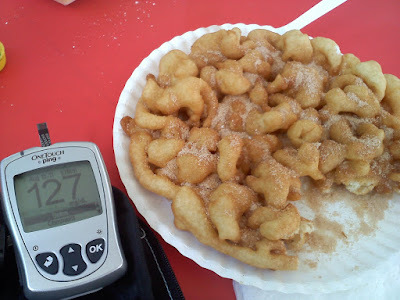 Mmm, Funnel Cake and normal blood sugars = YAY!!! Crazy about the corn, we'll have to tell our dieticians that we, in fact, SHOULD be eating funnel cakes instead of veggies...Ha! whoo hoo! this kind of thing happens to me all the time. except my "funnel cake" is a bar of chocolate. everything else makes my sugars go crazy. lol! Would Yoda be able to bring some funnel cake to the UK pretty please? Our ped. endo's book says 3" cob of corn is 15 g. Most ears are 6-8 inches - so I figure 30-40g for my son. And I find some of the things in the Ping menu to be kind of questionable. I don't think white and yellow corn would be THAT different.